Shane Baghai, owner of Paradise Farms in Caledon believes in “natural farming” with the long- term in mind. Seven years ago Baghai bought 200 acres in Caledon and began raising angus, Scottish highland and waygu cattle. Baghai is acutely aware of agriculture’s interdependent relationship with the natural world. On his Caledon farm he is conscientiously working to protect water quality and wildlife habitat to support the viability of agriculture in general. In 2013, through the Peel Rural Water Quality Program, Baghai fenced his livestock out of the stream that meanders through his farm. He also planted 1,306 trees and shrubs beside the stream to protect it from nutrients and bacteria coming from adjacent pastures. In 2014, Baghai installed solar panels and a small wind turbine on his farm. These produce 100 light bulbs worth of renewable energy. 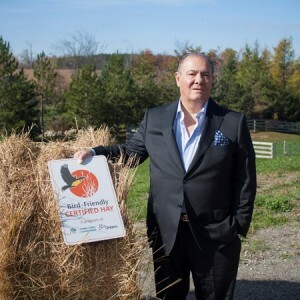 Baghai’s newest involvement in agri-environmental stewardship is his recent purchase of later-cut bird-friendly certified hay grown at Whole Village, also in Caledon. Whole Village grew 15 acres of bird-friendly hay in 2014, and participated as a grower in CVC’s Bird-Friendly Certified Hay Program. They want to protect the bobolink they see nesting in their hay fields. “We enjoy watching the young ones fledge from the nest in the summer and want to do our part to protect them and their habitat,” says Brenda Dolling of Whole Village. It’s apparent that Baghai is passionate about supporting local food and farmland around cities. He knows it’s increasingly important to minimize the distance that food travels before reaching the consumer. That’s part of what makes the connection between Paradise Farms and Whole Village so remarkable – Baghai can protect grassland birds and also purchase unique hay from only five kilometres away.